Congratulations YD. That is some great growth that you have had. Your dividends are compounding nicely for you. I can't wait to read about you crossing this milestone. Thanks for sharing. Awesome dividend growth! Keep on growing it! Very nicely written! Thanks for the motivation and congratulations on your nearly 10k/year forward dividend payments. I always come back to read your consistent reports. 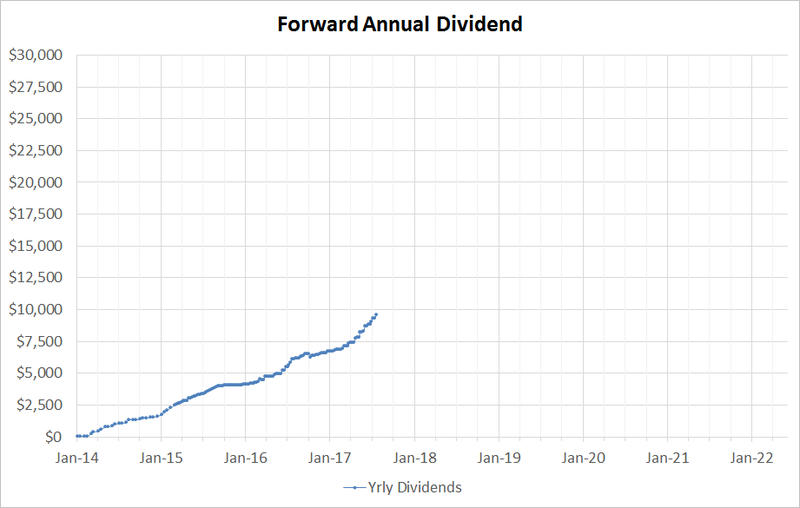 Your name, Young Dividend, is pretty funny now that we think about it - should start calling you Master Dividend with forward income like that! Congratulations and looking forward to being there, very soon, as well! That is some serious cash coming in to you. Congrats! That's some serious growth. Much faster than mine. How much are you contributing to your account each month on average? I contribute on the scale of a handful of thousands of dollars a month. I try to save 70-80% of my take home income (after taxes amount) for dividend paying stocks. The take home income that I spend is probably 70% on overpriced rental, 13% car, 17% living and entertainment. Sorry about the Google protection :( I'll see if I can find a better system. That forward dividend ramp is very impressive, and the trajectory for 2017 is even more awesome... keep it up! I'm looking forward to when you hit the $10K mark.